A sophisticated ‘walk-to-work’ construction and maintenance support and accommodation vessel has found immediate employment on Germany’s largest offshore wind farm, writes David Tinsley. The 93m Acta Auriga has attracted a two-year charter from Ocean Breeze Energy (OBE) to provide support for operation and maintenance (O&M) activities on the 400MW Bard Offshore 1 wind farm, located off the German coast. Handed over to Acta Marine by Ulstein Verft, the DP2-class vessel employs Ulstein's SX195 design, embodying both the X-STERN and X-BOW hull forms to enhance seakeeping performance and efficiency. The profile is also defined by fully motion-compensated, deck-mounted structures that enable offshore transfers of personnel and equipment in rigorous sea and weather conditions. Hull construction was subcontracted to Polish partner Crist Shipyard, and final outfitting of the vessel was carried out at the main contractor’s Ulsteinvik premises in Norway. 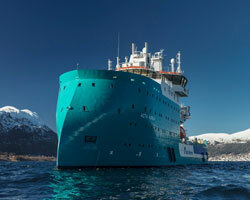 Acta Marine has subsequently booked a second newbuild of the same type, planned for handover by Ulstein Verft in Q2 2019. The X-BOW features a forward-tapered stem with a diverse volume distribution and sectional angles, to create a wave-piercing effect at moderate wave heights and to minimise pitching and bow impact loads in higher seas.The X-STERN form gives the option of manoeuvring or dynamic-positioning stern-first at the wind farm, reducing slamming and vibration and enhancing operability, flexibility and habitability. It is also claimed that keeping the X-STERN towards the weather enables position to be held with lower thruster load and associated fuel savings. Acta Auriga has accommodation for 120 personnel in 80 cabins. The SMST telescopic, motion-compensated gangway system provides safe walk-to-work operations up to a significant wave height of 3m. Capable of being deployed over either side of the ship, the gangway system is mounted on a height-adjustable tower. The integrated elevator enables step-free conveyance of personnel, equipment and materials from different deck levels to the gangway platform, up to a height of 23m, for transfer to the turbine.The vessel can also perform 3D-motion-compensated lifts of up to 6tonnes using a special knuckle boom crane mounted on the aft working deck, granting the vessel a lifting height of 36m above the water level. The crane offers a 20tonne load capacity when not required to operate in compensation mode. Acta Auriga has a cargo deck space of 1,000m², half of which is under cover. A total of 24 TEU containers can be stowed on the two deck levels. The diesel-electric power plant is based on four Caterpillar aggregates, comprising two generators driven by 1,786kW model 3512E diesels and two sets using 940kW C32 Acert engines. The main propulsion thrusters at the stern are Rolls-Royce type US205 azimuthing units, while the foreship underbody is fitted with a 1,040kW tunnel thruster and two 880kW swing-up thrusters, all from the Rolls-Royce portfolio. The DP2 system can be controlled from four operator stations.The propulsion arrangements enable transits at 13knots at the design draught, while the X-STERN affords the flexibility to run astern at speeds up to 12.5knots during offshore assignments. The vessel has an offshore endurance factor equating to approximately 30 days.